As root vegetables go, Salsify is not the most commonly known. Although popular in Italy and France, Salsify has not been widely eaten in the UK since the Victorian Era. 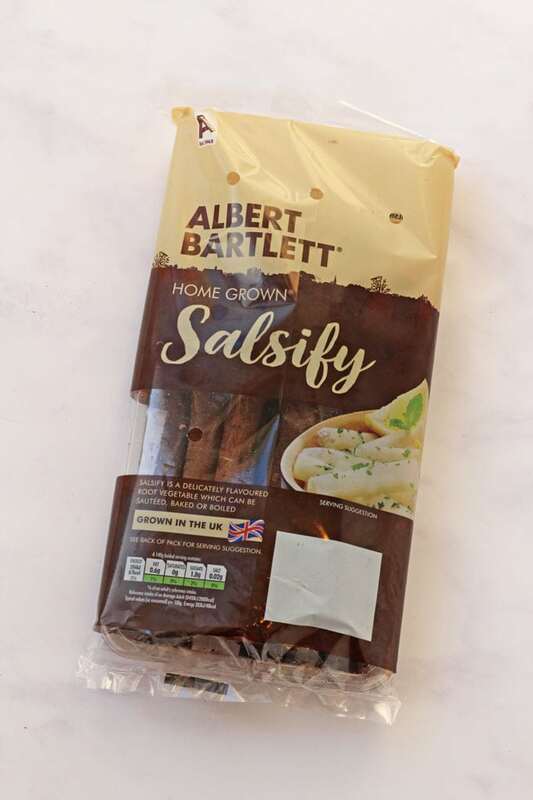 This year, however, Albert Bartlett are bringing salsify back on the British menu by cultivating the vegetable for the very first time. Albert Bartlett have supplied 100 Waitrose stores with the vegetable and the season is expected to run through the spring. Salsify is surprisingly in the daisy family. Black salsify grows to around 120cm tall with grass-like leaves It also has a decorative and edible purple / pink flower and harvest is usually between late September and December. 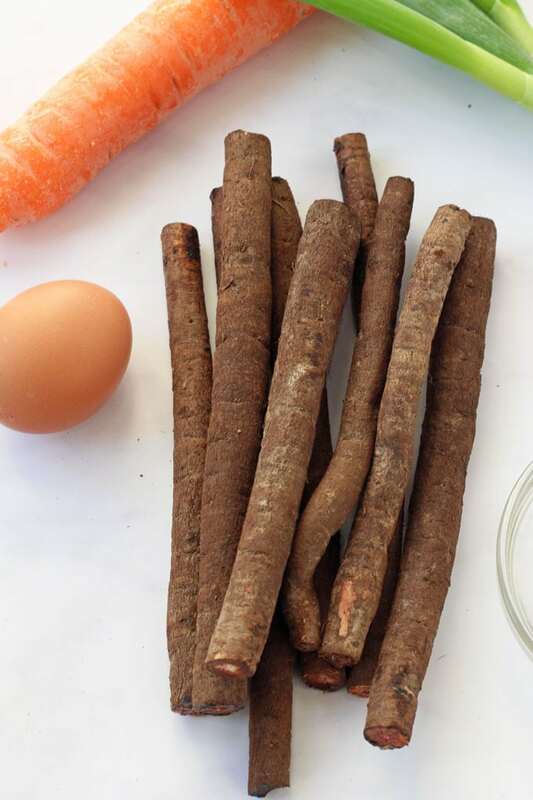 The salsify root is a vegetable with a subtle flavour. It’s taste is unique – a little like a mild artichoke, perhaps with a trace of liquorice or, when cooked, some even claim to detect a hint of oysters. How Do I Cook Salsify? Salsify is very versatile when it comes to cooking. It can be sautéed, baked, fried, mashed, puréed or creamed to make soup. It can also be eaten raw as long as you wash it peel and then grate it or chop it finely. How Do I Prepare Salsify? When peeled salsify instantly starts to brown. But this can be prevented by having a large bowl of warm lemon water to pop the salsify in to. However, I’ve found that when grating the salsify, this doesn’t happen and there is no need to soak it. 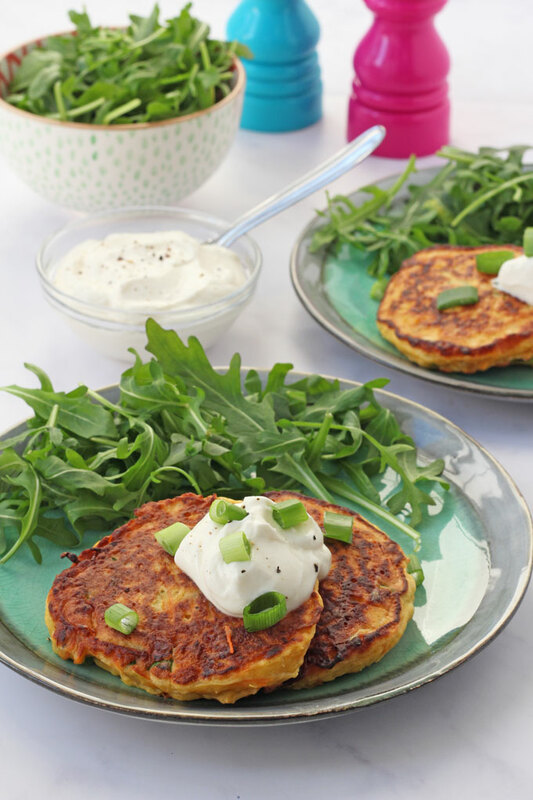 I decided to use the salsify to create some delicious savoury pancakes. 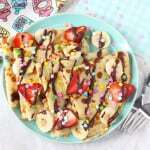 When we think of pancakes for breakfast or brunch, it’s usually sweet pancakes but savoury pancakes can be just as delicious and are also a great way to get a portion of veggies into your family early in the day! Salsify is a really great vegetable to feed to children and adults alike. It contains fibre, Vitamin C, B6, folate, potassium, manganese and a little bit of protein, calcium & iron. And then add the salsify (peeled and grated) and also a grated carrot. Once everything has been mixed up well, add a large spoonful of the mixture to a greased hot pan and cook for 3-4 minutes on either side. 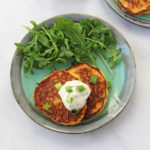 I served the Savoury Salsify Pancakes with creme fraiche with a little horseradish stirred through and some rocket on the side. For kids, just some plain creme fraiche or plain yogurt will be perfect. 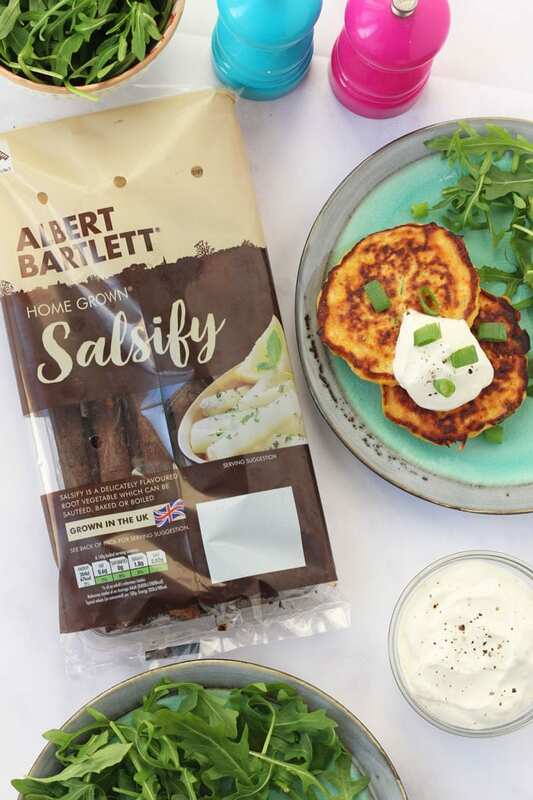 If you’d like to learn more about Albert Bartlett’s Salsify and see some more recipes, head on over to their website. Disclosure: I have been compensated for my time spent working on this campaign but all thoughts and opinions are honest and are my own. 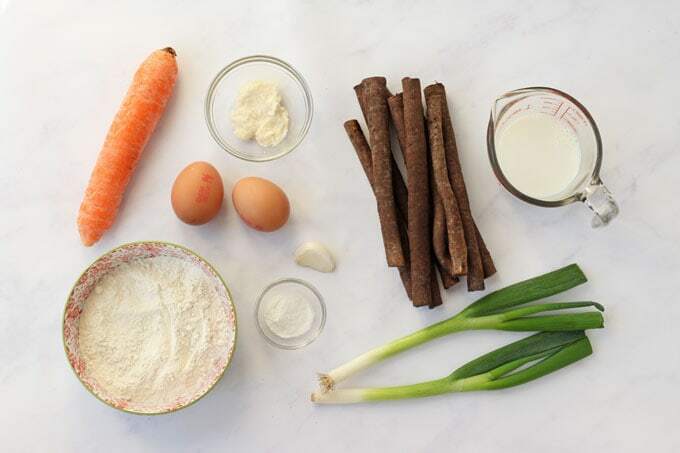 Wash and peel the salsify and carrot, chop of the top and ends and then finely grate both of them. 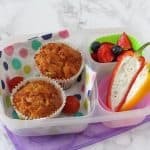 In a large bowl mix together the flour, baking powder, eggs and milk until there are no lumps. 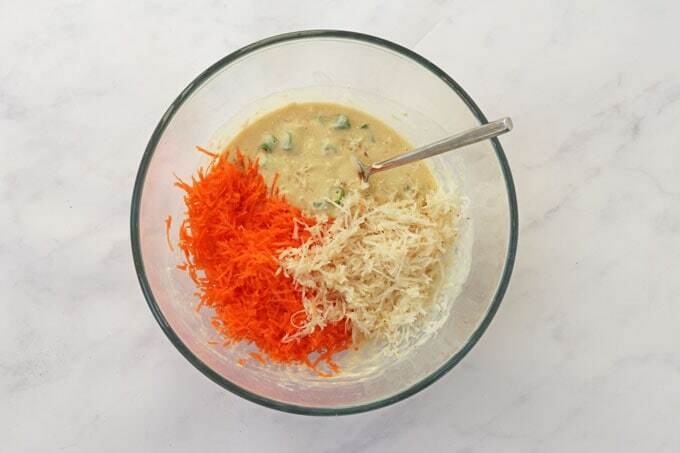 Add in the grated salsify and carrot, along with the spring onions, garlic and horseradish sauce. Mix well and then season to taste with salt and pepper. 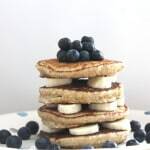 Add a little oil to a frying pan and take a large spoonful of the pancake mixture to make one pancake, adding it to the frying pan. 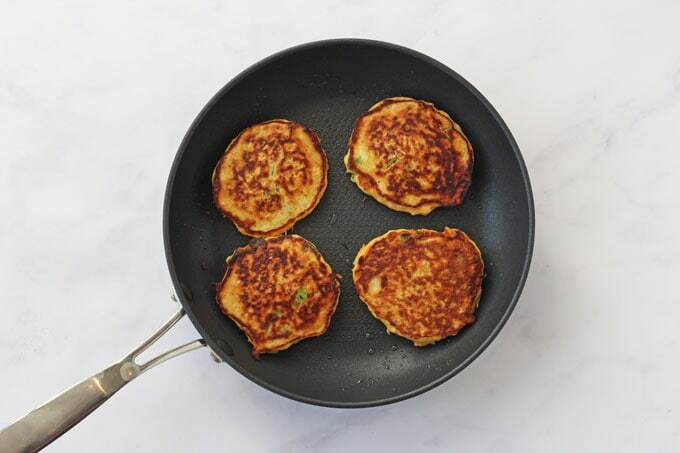 Repeat until you have 4 pancakes in the pan. Fry for approximately 3-4 minutes on either side until golden brown and cooked through. 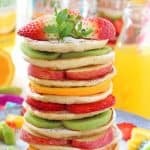 Remove the pancakes and repeat the process with the remaining batter. You should be able to make 8 pancakes from this mixture.